A Prayer Just for You! I’m excited to share with you a prayer I wrote last year. The first time I used this prayer was at a leadership event at which my dear friend, Lisa Allen, and I spoke in Albuquerque last August. We closed our event praying this prayer … 1,000 women standing together, locked hand in hand, cloaking our hearts, minds and bodies in the Armor of God. And then last month, the Lord gave me the opportunity to share it again at our Proverbs 31 She Speaks Conference. At the close of our session, Lisa Allen, Micca Campbell, and I had the honor and privilege of anointing over 200 women as they recommitted their hearts and their callings to God. Immediately after the anointing, we stood together, hearts aligned, and clothed ourselves in God’s Armor. As the words poured forth from our mouths, the Spirit felt so thick and full … I thought, surely the Presence of the Lord is in this place. Sweet and faithful friends, my heart desires the same for you!! You are such a gift in my life. My prayer warriors. My encouragers. My true blessings from the Lord. So, as this prayer goes out over my blog, I’m praying fervently for God to move in our midst. I don’t know when you will arrive to find the prayer and pray it, but God does. He knows who needs to be empowered and equipped with His Ephesians 6 Armor. Please know as I type these words, I am praying for every single women God draws here … and that includes YOU. Please leave your name in the comments below so that I can jump on and pray you by name. Heavenly Father, today we pray on Your Armor. Father, strengthen me with Your Helmet of Salvation. I am Your blood bought baby girl, a saved child of God. You have given me the Mind of Christ so that I can STAND against the culture and the lies of the evil one. 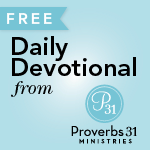 Father, cover my heart with the Breastplate of Righteousness. Thank You that Jesus defeated the power of sin and death at the cross, and it no longer has power over me. You have forgiven me of me of my sin and clothed me with Your righteousness. I STAND on that gift! Father, gird me with the Belt of Truth. I believe with all my heart that Your Word is truth, and it is that truth and that truth alone that sets me free. I choose to believe Your truth and reject the lies of the evil one. I STAND centered and strong against his temptations, deception, schemes and accusations. Father, I put on the Shoes of the Gospel of Peace. Make me ready to march into any battle set before me. Fill me with Your peace. I choose to be an instrument of that peace, to always forgive and not harbor bitterness, anger and unforgiveness in my heart. I STAND ready to live out and give an account for the faith I have in You today. Father, I hold up the Shield of Faith. I trust and believe You at Your Word that You are the King of kings, the Lord of lords, the Great I AM. You alone are the Author and Perfecter of my faith. I trust You to meet all my needs. I reject a spirit of fear and STAND in the spirit of Your power, love and a sound mind. Finally, I take up the Sword of the Spirit. I load my arsenal with Your rhema words given directly from Your heart to mine. I choose to hide Your Word in my heart. I choose to believe Your truth over Satan’s lies. Pour out Your Truth and Your Spirit over my life. 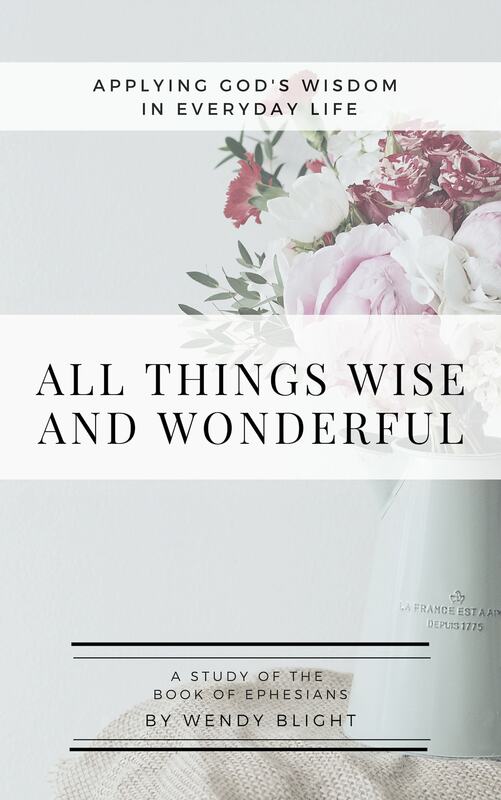 Fill me with all wisdom and understanding. I choose this day to STAND on Your living and active Word. Thank You, Father, for Your mighty weapons. Thank You that You have already won this battle. Thank You that I am a victor and that greater is You who lives in me than he who lives in this world. Thank You that I can do all things through Your Son, Jesus, who strengthens me. Today I surrender my battles to You and come under Your power and Your authority. Fill me with the fullness of Your Spirit. Use me to do Your Kingdom work. Father, show me Your Shekinah glory as I march onward as a child of the LIVING GOD. I ask all this in Jesus’ name. Amen. 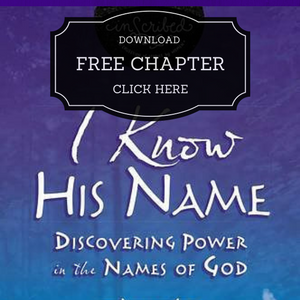 If this prayer touched your heart and you would like a copy for yourself or to pray, you can get a FREE copy by clicking here. And I would LOVE to pray for you by name. So if you prayed with prayer, please leave your name in the comments section. And if you get a chance to see War Room, which releases today, GO SEE IT!! I saw a sneak preview last night. POWERFUL movie about Prayer and Spiritual Warfare!! Click here for a sneak peek of the movie. **** The winner of Amy Lively’s”BIG Giveaway” is Randi who posted on 8/25 at 9:19 a.m. Thank you for this powerful prayer! I need to pray it over myself every day, and I am passing it on to my friends and family. This is a wonderful and very powerful prayer. Thank you Wendy! And thank you for praying for us. Please pray for me particularly on bitterness and forgiveness.. I love the prayer. I plan on printing it out and keeping it in my Bible. I need to pray that prayer before I battle in prayer for my unsaved children and grandchildren. Thank you for the prayer I loved the peace I felt while saying it outloud. Thank you for this sweet prayer this morning Wendy 🙂 I couldn’t stop myself from praying it out loud and found myself saying YES throughout! 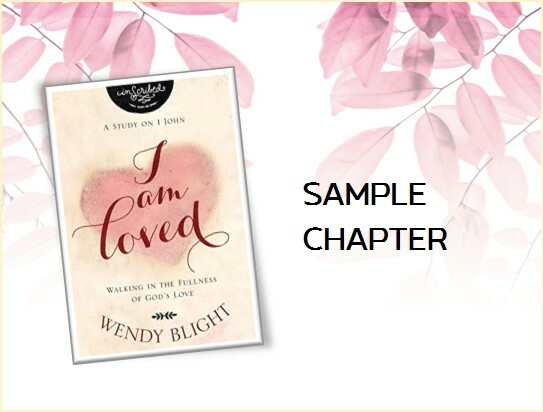 I have printed copies for each of the women in my Bible Study group and will pray it with them this morning. Thank you for this prayer and the reminder to put on our daily armor. I love your sweet spirit and your powerful reminders to share in the Spirit! My name is Diane and thank you for this prayer I prayed!! Just what I needed! Thank you for this powerful prayer! I am going to pray it daily! Thank you Wendy for this prayer. Please pray for my 2 adult sons who need Jesus! Awesome prayer! Thanks for sharing as I will with my family and friends. It is so important that we put on the full armour of God daily over ourself and our families. Thank you sharing this Powerful Prayer. This prayer really makes me feel covered by the armor. Thank you, Wendy. My name is Vickie. Thank you for this wonderful prayer. Thank you for praying for me! Thanks for sharing this powerful prayer. And thanks for praying for me by name – T.K. Floyd, San Antonio, Texas. Blessings! Carol – I will be sharing this with a special friend. Thank you. Thank you for sharing this prayer with us this morning. I will keep a copy in my Bible and pray it each morning, and I will share it with my Bible Study group and others. Thank you Wendy for this powerful prayer!! 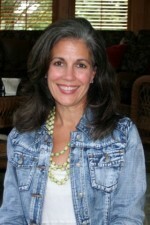 Thank you for praying for me-Karen Conner. I’m sharing on facebook and will print to hand out to the women I cross paths with. Thank you for your faithfulness and love for us! I pray God continues to bless you and keep you safe and healthy. love & hugs my friend!! Thank you for the special prayer on the Amor Of God I prayed it and would be honored if you would pray over my name…I am reading the war room as we speak and I am planning on seeing the movie. This came at the best time since I live in Florida and Expecting the storm Ericka to come this week. Thank you again and God Bless all you ppl responding to this blog. Thank you for this prayer this morning. Thank you for the prayer. I not only prayed it but shared it with friends. Yes and Amen! Need this . Please pray for comfort for my mom who lost her sister to cancer. Heavenly Dad, Thank You for prompting Wendy to post this Spirit-led prayer at the perfect time. I lift Cindy’s Mom to You. You know the beauty of sisterhood and the very special relationship that only sisters can share. You know the ache in her heart. Let her Mom be fully fitted with Your armor, protecting her mind and her mourning heart. Let us hold our shields of faith to cover her Mom since she is probably exhausted. Show her right now that she is Your Ruth and You are her Heavenly Boaz. She can rest at Your feet while You take care of her! In Jesus’ Name, Amen! Thank you for sharing your prayer and being a light! Hi also, Wendy, saw this powerful movie last night with a large group of churches. We cried, laughed, applauded. I heard some “amen’s” in the crowd. It was inspiring for me to continue my War Room efforts for my children and grandchildren. 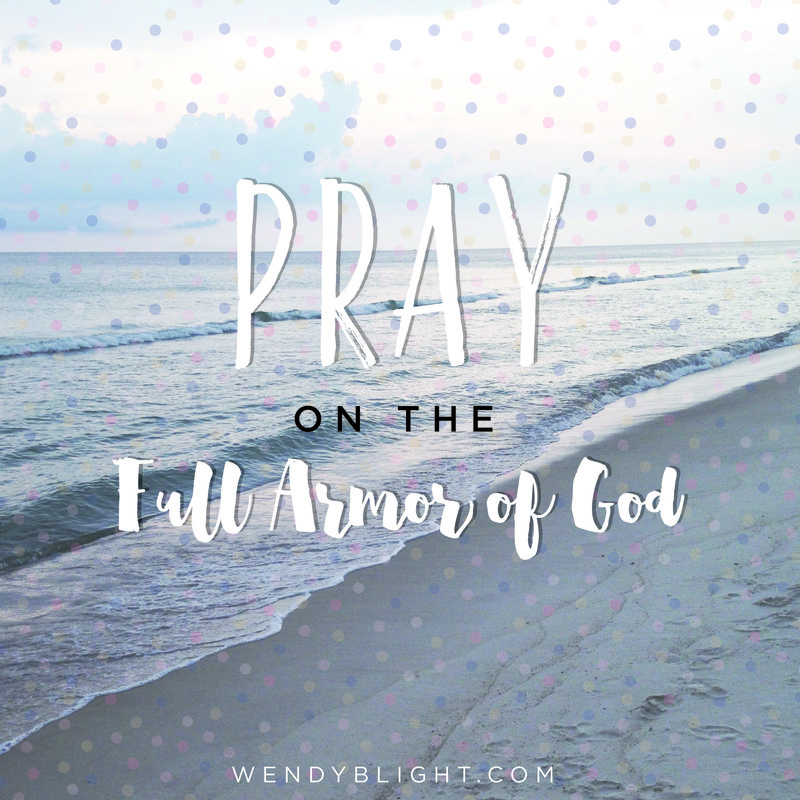 Starting in September, I’m leading a group of women in the Bible study series by Priscilla Shirer called “The Armor of God.” This prayer is what I’m going to use at the end of our 6-week session. God is at work. He’s calling the Warriors to prayer. I loved the ending of that movie where we hear the older woman speaking about the Warriors coming together and then we see young people gathering, church families gathering, older people praying, soldiers praying, athletes praying. God is calling His army. I want to be in that row of soldiers marching to the rhythm of His chant. As always, perfect timing! Thank you for this prayer, and I am definately sharing this. Thank you for this powerful prayer, Wendy! I’m going to share it with the ladies in our women’s group. May God bless you!! 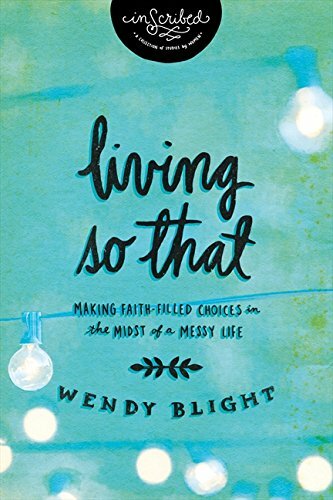 Thank you for sharing this Wendy…it took me right back to She Speaks – that was a precious, powerful Spirit-filled time! The great thing about God is it was also powerful to pray it right here in my house and spoke to situations going on, thoughts I’m thinking and emotions I’m feeling. Thank you for your prayers Wendy and living out Gal. 6:2. Grateful for all those who help carry my burdens! Blessings to you! Thank you for the prayer!!! Wendy thank you so much for standing in the gap for so many women. You have such a gift for beautiful prayers. I, Carol Blakney pray the armor on every morning but not with the additional beauty that you have added to it. I pray for you Wendy that the Lord would continue to give you such beautiful words and ears to hear as you share and touch so many lives. Thank you for praying for me. Thank you, Wendy! I will definitely be printing this prayer and praying it daily. Thank you for praying for me by name! My heart is heavy for my family’s salvation and several friends who are ill and their family members who are taking care of them. 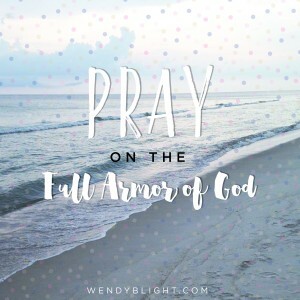 I needed this armor prayer especially today as I fight a big spiritual battle headed my way! I’m praying for you and your ministry, too! Thank you Sweet Sis for your beautiful and annointed prayer..Add me to your list..and I will surely pray for you…God Bless You and Keep You in HIs sight…Carmen from Indiana. Praying together, hand in hand, with everyone here. Love you, Wendy. Thank You for praying for me and for teaching me how to pray God’s Words back to Him. Thank you for this wonderful prayer. What a great way to start the day. Wow!!!! Just what I needed…..what a powerful prayer….thanks for sharing!!!! Thank you for blessing me this moening with your prayer! Thanks for the prayer! I needed that reminder this morning. Praise the Lord God Almighty for working in mighty ways in each of our lives through this prayer! Praise the Lord for how He is working in mighty ways through the War Room movie~ to call the body of Christ to be prayer warriors for His Kingdom and glory and do damage to the enemy’s work. Love your prayer Wendy and prayed it with you. Excited to see War Room tonight or tomorrow. May the Lord draw people to Salvation and many people to dedicate quality time to bold prayers for God’s Kingdom and glory. Amen! Be blessed, ya’ll! Thank you for the prayer! I really need prayer for my health and for my daughters health. Thank you, Wendy. Love your heart for The Lord! And thank you for praying for me. I will pray for you, as well. Thank you for this prayer! Tears were flowing as I prayed. So powerful! Thank you. I feel so weak. I have struggled these last few weeks to find motivation to do the work set before me at work and school. I am pursuing my calling by getting the education necessary to become a counselor. I work full time and hobo school full time and am in the middle of my degree completion program. I am fatigued. I could no have made it this far without God’s supernatural intervention intervention. I have been kind of in a fog lately not connecting with the heart of my Father and relying on His power. I need your prayers. Heavenly Dad, let each word of Wendy’s prayer grow deep roots in Shasta’s heart. You love her like crazy. You tell her that she sets her mind… on school or with her job… and You direct her steps. Bless her with that confidence in Jesus’ Name. Let her be refreshed as You lead her beside quiet waters to restore her soul. Bless Your precious girl in Jesus’ Name, Amen! Thank you for this powerful prayer. Much needed encouragement as I’m lifting up my son and daughter-in-law who are major marital problems. Thank you for your prayers and lifting you up as well. Thank you, Wendy for this beautiful prayer. God’s perfect timing! I’m fighting OVERWHELMING ANXIETY today! I’ve prayed this prayer to my Abba Father and I thank you Wendy for praying for me Tracy Law. Thank you especially for the words in the Shield of Faith and the Sword of the Spirit. Praying for faith and strength in my marriage. Thank you for sharing the words the Holy Spirit shares with you to encourage all of us! Thanks for a beautiful prayer based on Scripture. Wendy, I am going to begin praying this aloud for each of my daughters and their families. What a powerful prayer!! Thank you for sharing! I’m sharing this with family and friends. My pastor preached on this last Sunday, so I’m taking it as confirmation. I need God’s armor for the battles ahead. We don’t have to walk around feeling vulnerable and unprotected. Let’s suit up!!! Thank you for this anointing prayer Wendy. We can not go into battle without the armor of the Living God. We are each called to honor and glorify the LORD uniquely yet as one body. Blessings to each woman whose comments are an affirmation of the Truth of Christ. Thank you for sharing such a powerful prayer! A group of ladies from our church are going to see the War Room movie together and I will be sharing this prayer with each one of them and also other family and friends. Thank you for this powerful prayer and for praying for us. Thank you. God definitely led me to this prayer today. Thank you for this prayer and for lifting us up. Please include my marriage and family in your prayers. The enemy is trying to steal it away. Wendy – thank you so so much for this! What a blessing your God centered prayers are! Thank you – You were lifted in prayer by me this morning as well. XOXO! My heart is truly overwhelmed at your response to this post. And I want each one of you to know that tomorrow morning I will be lifting each and every one of these prayers before our Great God on your behalf. Thank you for entrusting me with your prayer requests. And thank you for those of you who have shared this with your friends. I can only imagine how our Father in heaven ENJOYS and DELIGHTS IN hearing His girls all over His earth praying on HIS Armor!!! Satan has no place in our lives and TODAY we are putting him in his place!! Thanks for the prayer. I hope to go see War Room this weekend. It’s not playing in my town so we have to go to another town. Look forward to starting First5 Monday. Have a great weekend. Thank you for this Wendy. It’s awesome!! Our Group Bible study may be doing spiritual warfare this next time around(i just have to make that decision ). This would be awesome to use (if i may share?) As well as with women in a larger scope (ooh, i should just email you…) anyway…thanks so much for this. I love the idea of praying this and anointing the women. Seeing War Room tonight with friends. Moms/kids night. (hubby’s are working). I am bringing tissues for all. So craving a closet for prayer. And more discipline. I need to be writing(been asked to contribute (monthly) about prayer , prepping to speak (a teeny bit) in October. Carol, I would be honored for you to share it. The more people we have praying on the Armor of God, the more powerful a force we will be on this earth! SO thankful for your friendship and faithfulness. Thank you! I mentioned it to our women’s director, tagged her, linked your blog in an email, emailed the copy. And asked if we could perhaps use it at a larger multi regional conference during the women’s service portion and she said “Let’s talk.’ 🙂 I’d also like to use it again when we have (in the future, not planned a date yet) a regional women’s conference. Somewhat more intimate , and perhaps more women. Thanks again. Thank you this beautiful prayer. Add me to your prayer list. Such a powerful good prayer…. Needful in season and harvesting. I ask you to pray this over each one left by suicide loss! Thank you sweet sister! Beauty for ashes… Isaiah 61:1-3. Wendy you are such a kind soul. This prayer is what I needed at this moment. I have been feeling parched in my spirit, emotionally and mentally drained and physically weary. I have been saddled with financial mess and it seems to be attacking me right now. Please pray for me. I appreciate what you are doing for women. THANK YOU for this Wendy!!! I am sharing this on facebook (I know, I know……I feel like I share ALL of your stuff on fb!) and I am printing this to put in my bible as well! I appreciate you so much and you’re a beautiful blessing to so many far and wide!!!!!! Please pray for my daughter, who is going through a divorce. I very much want her to know how much the Lord loves her and know he always will. Thank you Wendy for your prayer. I ask for prayer for renewing my mind. To trust God and His word and to stop letting the devil have space in my mind. Thank you so much Wendy for your prayers. Thank you so much for this prayer. We actually discussed it at our bible study last Wednesday. Thanks for the trailer for the now showing War Room. It is on my to see list. Thank you for this spirit filled prayer. I so desperately needed it today; you are being used for God’s kingdom work. Thank you for sharing. This was my absolute favorite part of She Speaks this year! So powerful and exactly what my heart was yearning for in that conference. Thank you Wendy!! Thank you for sharing God’s Word in such a beautiful way! I need prayer for an up coming very needed sinus corrective surgery I am having Sept 10/2015. Please pray for wisdom for my Dr and his team. For quick healing and recovery as I am deathly allergic to narcotics and won’t have any medication for pain afterwards. All I am allowed is extra strength Tylenol, but this stuff never helps me for pain or headaches. Please pray for my walk with Jesus, for wisdom, discernment and revelation in my life. I want more of Him in my life! I want to be a Faithful servant for His Kingdom and His Glory. Please pray also as you feel lead. Thank you Wendy for this prayer. 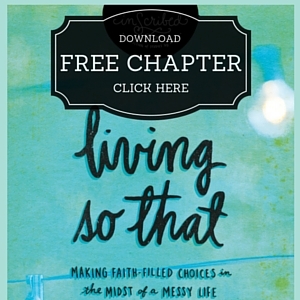 I downloaded a copy and am going to pass it on to the ladies in the Bible study group I attend. God bless you and your ministry. Thank you Wendy. God has blessed you with the way you encourage others. Please pray for two of my past students who have been diagnosed with cancer and please also pray for an old colleague of mine who is also battling cancer. Their names are: Jessique, Dru, and Shannon. Thank you and may God continue to bless you. Wendy thank you for such a wonderful prayer. What a blessing it is to me and I’m sure many many others. May God continue to use you in a mighty way. So when I saw this just a few moments ago , it hit my heart refreshing words . Just want to thank you for praying for us . Please continue to pray for me as I walk with Jesus and shine his light to the people I am around and that people see Him in me . Thank you so much for this beautiful reminder of those precious moments in July. I’ve never more powerfully felt God’s presence than in that space of prayer and worship. As I begin my 21st year of music ministry, I’ll hold this prayer close. 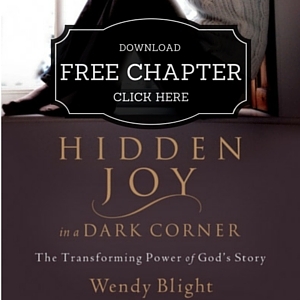 Wendy, Thank you for this beautiful prayer based on one of my all-time favorite scriptures. Thank you for this prayer. Please pray for me Mary, my daughter PJ and Granddaughter Helena. Satan is seeking to use poor choices from my life to destroy them. I know God is greater than the evil one. I need his help. Thank you so much for this prayer. I’ve been trying to find a good prayer for putting on the armor. You have exceeded my expectations! Thank you Wendy! Please pray that the Breast cancer is gone. Thank you for reminding me how important it is to put on the armor of God. Thank you Wendy. This prayer has blessed me. It’s what I needed and I will continue to pray it. Wendy thank you. Gods timing is perfect. I needed this prayer at this exact moment. Praise God for his grace and his faithful servants like you who are obedient to his call and allow the Holy Spirit to work through you to the benefit of so many. I’m facing some unknown health issues and trusting God and combatting the enemies lies is a daily struggle. I’m believing in and trusting my sovereign Lord and his providence. Thank you for sharing this powerful prayer! I will surely print this prayer and put it on my wall to pray it everyday. I believe everyday we face battles in many sorts, therefore we must equip ourselves with the whole armor of God everyday. Please support me in prayer because tomorrow I will accompany my landlord to church, her son suffered depression, but I believe God has healed him already. God is doing something in their family and I believe for salvation for their entire family. Thank you once again for this prayer, this is much needed! God bless you! Sweet friends, I have had the most precious time in prayer this morning, praying for each one of you (and those for whom you asked me to pray) BY NAME. How I wish I had the time to tell you how the Lord led me to pray for you because I KNOW that we would hear some amazing stories as He connected our hearts through your words and the prayers He laid on my heart, But I have asked that He would reveal to you in very intimate ways that He is at work in the prayers we have prayed together the last few days. And thank you for praying for me. I was overwhelmed by how many of you said you were praying for me and my family. I’m so very grateful. I know you could be reading many other blogs and investing your time elsewhere, and the fact that you choose to stop by here and share your lives and your hearts with me means more than you will know. I love you all. Thank you for sharing this prayer with your friends and family and churches and Bible studies. I know God will be at work as we all suit up and enter into His World fully armed and ready for anything that comes our way!! Thank you for this beautiful prayer. Thank you Wendy! May God continue to bless you as you bless all of us by your loving prayers and words of encouragement. Thank you for this wonderful prayer! Wendy, l thank God for you, your love for His people. This enemy is real in my life. I hear many negative voices and need this prayer so very much to live the victorious life for His Glory. I want to know Him more and be used of Him to reach out to others & my siblings for His Kingdom. Amen and Amen! thank you so much Wendy for this powerful prayer. Pleas pray for my three children: Zoey, Pat and Kimberley for their salvation. This was so timely I needed it as I was going through some doubts. May the good Lord continue using you to encourage us. please pray for me and husbands financial stability to keep taking care of our two grandchildren and the child that was left with us. this prayer I will pray as often as possible. thank you!!!! Thank you, Wendy, for sharing this prayer. I prayed it this morning for myself and, where appropriate, my loved ones. I will be passing it on, too. Please pray for me regarding my tongue/attitudes – especially at work, but with other individuals. I need boldness to stop (diffuse?) gossip as God gives me words, and/or strength to just walk away. Thank you for being you for us, Wendy. You are correct, God knows when each of us needed to read this. Thank you for praying for everyone who reads your post. Please pray for me as I lay down a stronghold I’ve been batteling for too long. I pray father for each person who has left a comment, you know each struggle. I pray each of us will realize the power we have in you. My name is Katherine. Thank you for praying for me. Thank you for sharing this prayer. I need all the armor of God to fight the war that the emery wages against us each day. Thank you Wendy for sharing this prayer. I will be sharing it with several women – my 2 daughters and some friends. I covet your prayer as I seek God’s guidance about a request to step into a ministry role, after an extended time recovering from some church hurts. I thank God for the gifts you are sharing with us. Thank you Wendy for your sweet words and the prayer of God’s Armor , I need this right now, thank you. Thank you for posting this prayer. I am in great need of prayer right now. I am being attacked from all sides. I will read this daily. Thank you for your prayers. Thanks.for.sharing the prayer and praying for me, Nikki Johnson. Thanks for sharing the prayer and praying for me, Nikki Johnson. Thank you for this prayer today!! I really needed it today!! I feel as I have been attacked at all sides the past couple of months and I have wanted to just give up at times but this prayer has given me a new perspective today! Wendy I prayed this prettiest. Thank you so much for posting it. It is so needed for me and my family today. I ask you to pray specifically for my husband, Dave, he is having a lot of health issues right now. He has three major problems right now, Parkinson’s, low sodium, which causes lots of problems and now possibly cancer growing in his prostrate. Please pray for healing as we go to get more blood work done in a couple of weeks. Thanks again! Thank you for such a wonderful prayer. Please pray for me to find the strength through God’s word to make it through each day. 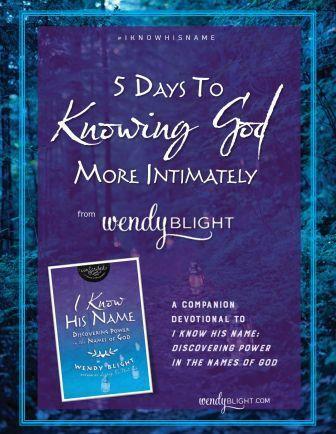 Wendy, without knowing it you have encouraged and lifted me up through the years with your knowledge and wisdom in God’s word. Thank you for the invitation to be prayed for. I need a release from fear and unworthiness and to forgive. Appreciate very much….just love it. I am overjoyed to have found this and strengthened as I read this prayer again. 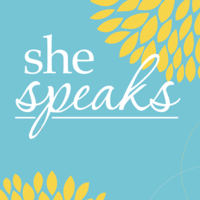 We all read it together at She Speaks. As I told you after your talk, it was life changing for me. I had emailed you to see about getting this prayer and am SO blessed this evening to have it my hands and to read it aloud. It is so powerful! I will use this prayer again and again. Hearing the words God gave you to speak were so life giving to me. I pray God pours out His blessings upon you. Thank you for this! I so appreciate your praying for me! I love this prayer and will save it and pray it again! Bless you! Thank you for sharing and praying for and with me. Just by accident found my way here while preparing for First 5. Thank you for your ministry Wendy. Your prayer refreshed for me the truth of the armour if God that I used often a long time ago. 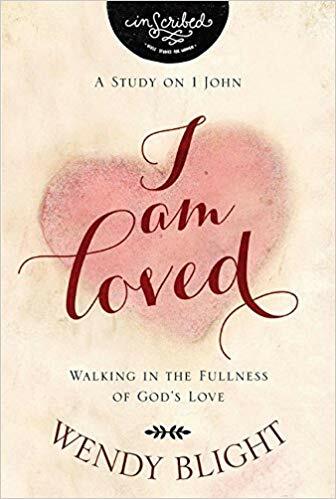 I post, hoping that you might still be able to pray for me, that I can believe God is with me and I can know his authority as I walk into my days battling unworthiness, uncertainty about my calling, and fear of not measuring up. Blessings to you. Thanks for this beautiful prayer. Please pray for us. My walk of faith in life I kn isn’t over yet.but I hv grown to weak to stand in battle if needed.so Father I ask in Jesus name to be carry until my strength is gain with all ur showers of love .I need to be held by u Father I love u so much and u do me as we’ll.Thank U Amen Patricia Forder. Here for example is a Prayer of all prayers, seek and you shall receive. This prayer was meant for me and if can be yours. I ask all this in Jesus Christ my Lord and savior. God bless you and yours to whom ever reads.